Find artworks, auction results, sale prices and pictures of Charles Willson Peale at auctions worldwide. Mr. and Mrs. E. Ross Millhiser, Richmond, Virginia, circa 1952; Kennedy Galleries, New York; George Strichman, New York; Sotheby's New York, American Paintings, Drawings and Sculpture Including Property from the IBM International Foundation, May 25, 1995, sale 6713, lot 172; Alan Miller, Quakertown, Pennsylvania. New York, The International C.I.N.O.A. Exhibition, The Grand Gallery, 1974, no. 98. Charles Coleman Sellers, Portraits and Miniatures by Charles Willson Peale, Philadelphia, Pennsylvania, 1952, nos. 764, 766, pp. 188-89; George Parker, \“Merchants and Planters: American Portraits of the Colonial Period and the Early Republic,\” Wisconsin Academy Review: A Journal of Wisconsin Culture, vol. 43, no. 4, Fall 1997, pp. 26-27, illustrated. According to Charles Coleman Sellers, "Thomas Russell, born at Birmingham, England, in 1741, came to America in 1764, settling in Cecil C., Md., at North East Forge, near Charlestown... Coming of a family of British ironmasters, he was a key figure in the transplanting to America of that industry, so vitally important in the movement toward revolution and independence. With Lawrence Washington and other prominent men who doubtless depended on Russell's technical knowledge, he was one of the organizers of the Pricipio Iron Co... Ann, daughter of Samuel and Mary Thomas, was married, after the death of her first husband, Thomas Russell, to Daniel Sheridine. 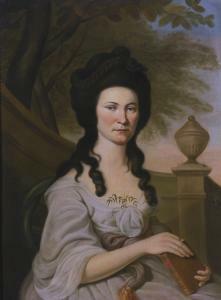 This portrait, retained in her own home, carries the detail of the wreath of roses, lacking in that sent to England" (Portraits and Miniatures by Charles Willson Peale, Philadelphia, Pennsylvania, 1952, pp. 188-89). Appears to retain its original stretchers and frame. 36 in. by 27 in. 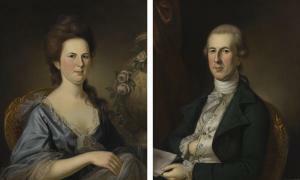 Freeman's Auctions, Philadelphia, Pennsylvania, October 8, 1992, sale 507, lot 1106 (the companion portrait, also by Peale was offered separately at this auction, see note). When Sellers published his book in 1952, he noted that Mrs. Robert E. Brooke of Philadelphia, a descendant, owned both the portrait of Mr. and Mrs. Ewing. The two portraits were separated in an auction in 1992. 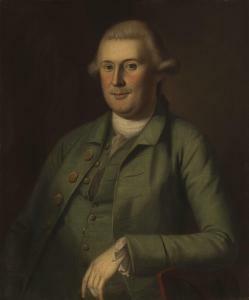 The companion portrait of her husband, Maskell Ewing is now in the collection of the Sewell Biggs Museum of Art in Dover Delaware. 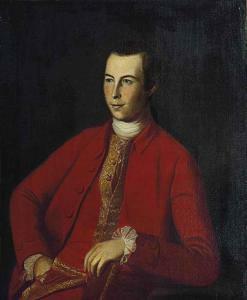 Charles Coleman Sellers, Portraits and Miniatures by Charles Willson Peale (Philadelphia: American Philosophical Society, 1952), p. 74-75; illus. p.314 entry 251, fig. 187. Charles Willson Peale (1741-1827) Portrait of Captain John Lewis (1747-1825) oil on canvas 31 x 26 in. 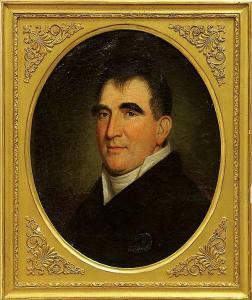 Charles Coleman Sellers, Portraits and Miniatures by Charles Willson Peale (Philadelphia, 1952), pp. 126, 282.